1 of 4 Combine chile powder, cumin, oregano, dry mustard, cinnamon, cloves, ginger and nutmeg. Set aside. 2 of 4 In a large, heavy pot, heat olive oil until it begins to sizzle. Stir in onions and garlic and saute for 5 minutes. Add green pepper, salt and ground spice mixture and saute 2 minutes longer. Add ground beef and stir. Brown the beef, about 3 minutes. Add tomatoes with juice and crush tomatoes while stirring in. 3 of 4 In a separate saucepan, mix the liquid from beans with the bouillon cubes; set beans aside. Cook until cubes dissolve; add this mixture to the chili pot. Taste and add additional seasoning, if necessary. Simmer chili at least 2 hours over medium-low heat, uncovered, adding water as necessary. Refrigerate chili overnight to allow flavors to fully meld. 4 of 4 Bring a large pot of lightly salted water to boiling. Cook spaghetti following package directions, about 10 minutes. Drain and keep warm. Gently reheat chili over low heat. Stir in reserved kidney beans and heat through. 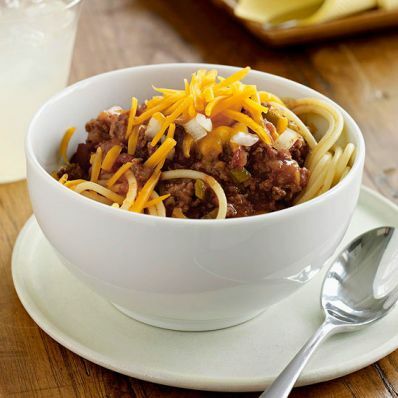 Serve chili over noodles, topped with additional chopped onion and shredded cheddar cheese.